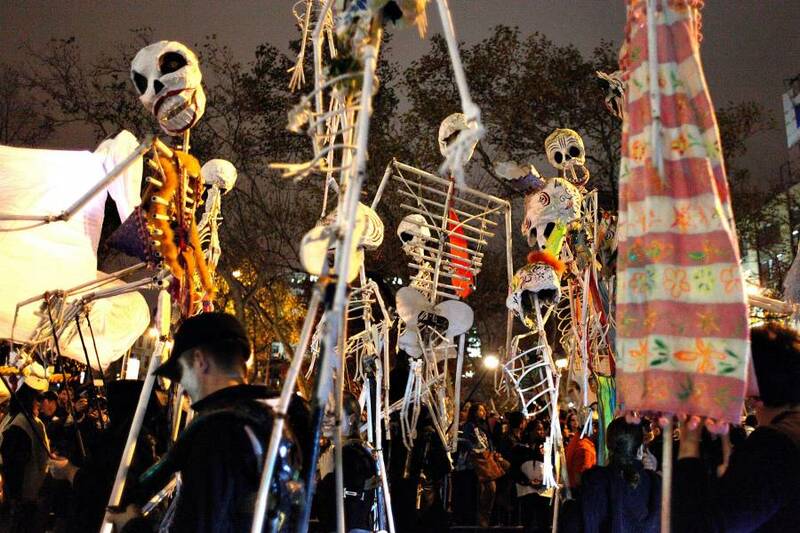 There’s a lot of fun stuff to do this fall in New York City. 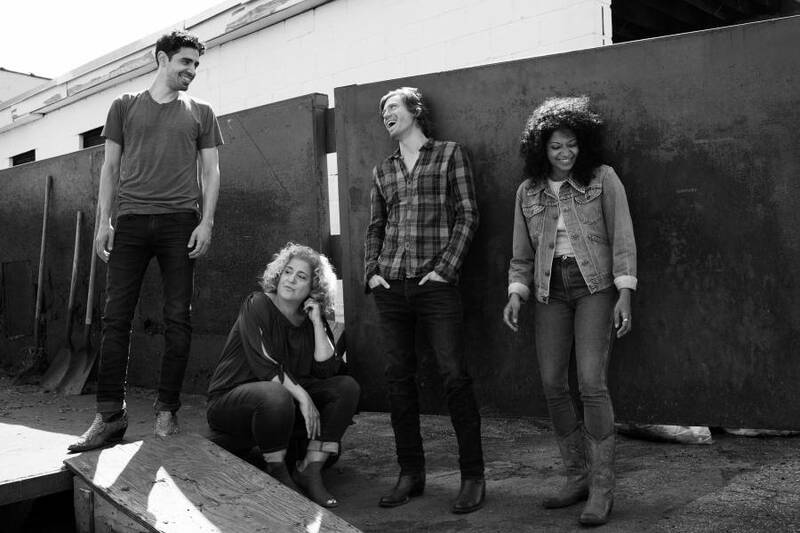 Take a look at these openings, concerts, festivals, performances and all-around-good-time events to find out why we’re excited (and be sure to mark down on your calendar whatever strikes your fancy). 17. You won’t have to leave NYC for a day in the country. Celebrate the harvest at the Queens County Fair—which starts on the first official day of fall, September 22. 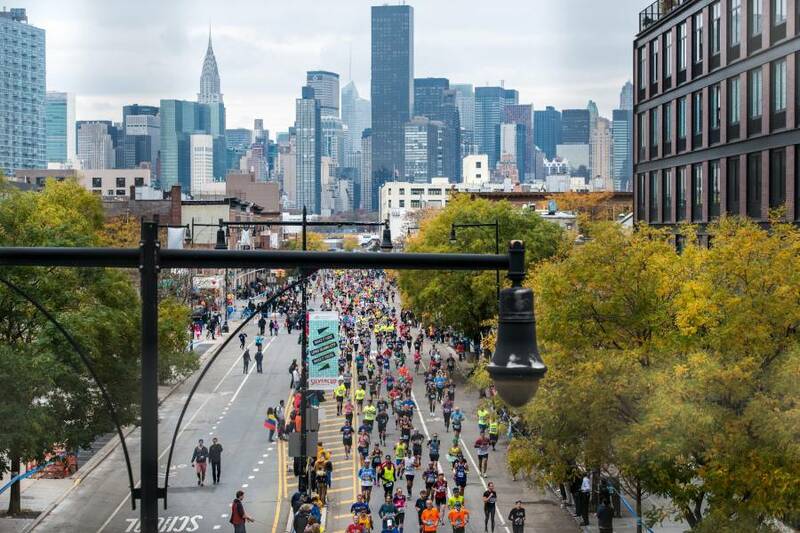 Located deep in the borough on Queens’ last working farm, the fair features carnival rides, hayrides, pie-eating contests and an actual corn maze. This entry was posted in Chappaqua and tagged Chappaqua Homes for Sale, Chappaqua Luxury Real Estate, Chappaqua NY Real Estate, NYC on September 27, 2018 by Robert Paul. 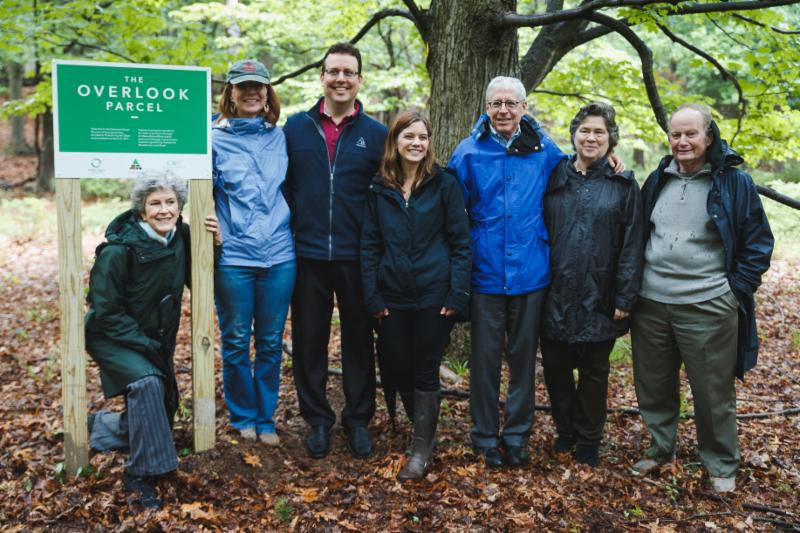 On April 27, the Open Space Institute donated 40 acres, known as the “Overlook Parcel” to Teatown. 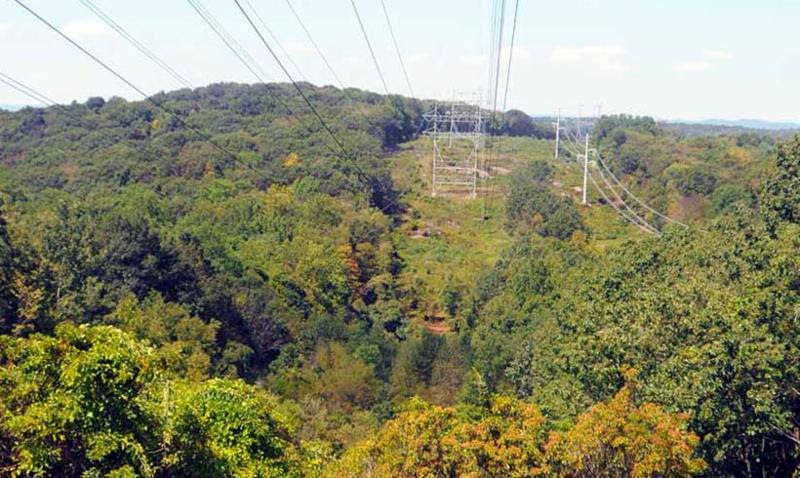 Under a conservation easement held by Westchester Land Trust, it is now permanently protected. 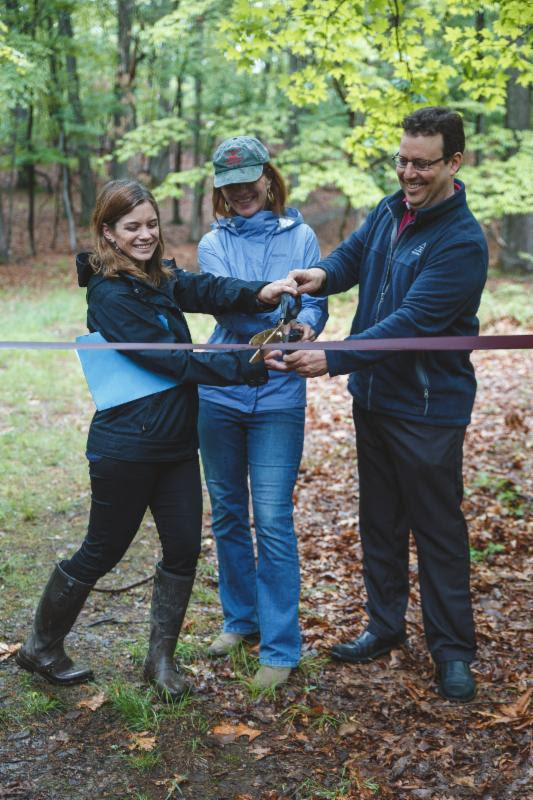 We made it official this past Thursday with a ribbon-cutting, attended by Teatown board members, Merrilee Ingui of Open Space Institute, and Lori Ensigner of Westchester Land Trust. You may already be familiar with this parcel, which is home to one of our popular trails: the Overlook Trail. Teatown has been managing this land for twenty years, making it an instrumental piece of our preserve. 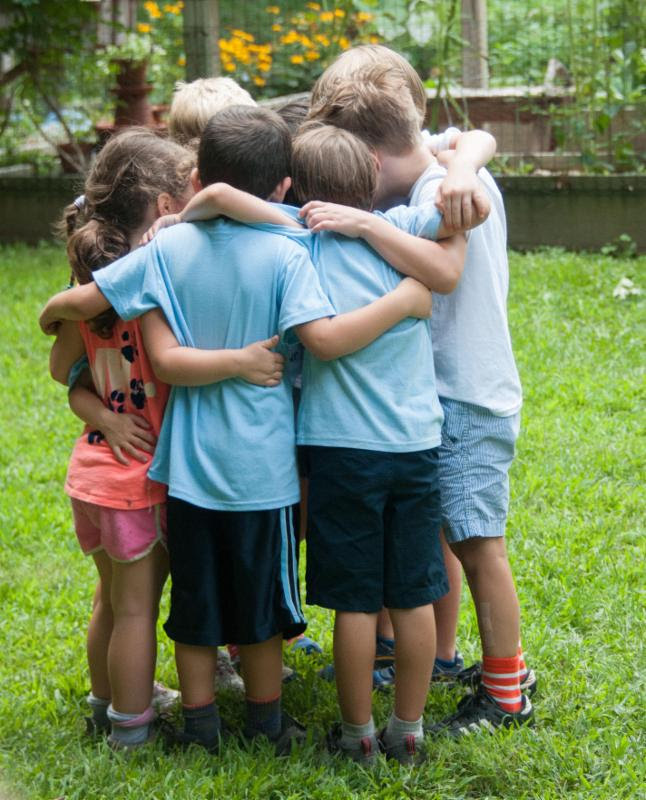 Our camp’s mission is to provide a safe, non-competitive summer haven where kids can be kids, learn by exploring, discover new things about themselves, each other and the earth, and develop friendships and respect for all living things. Click here to learn more. 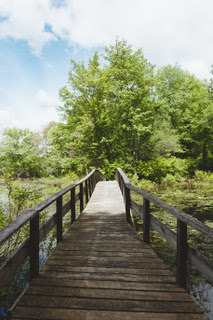 Stroll the winding paths and enjoy the beauty of Teatown from a different perspective! Guides will be stationed in the Gatehouse to answer questions. Teatown is evaluating the possibility of creating a members-only dog park. We’re interested in your feedback! Photography literally means “writing with light”. In May and June, H. David Stein presents his photographs in “Flowers in a Different Light” at Teatown’s Nature Center. 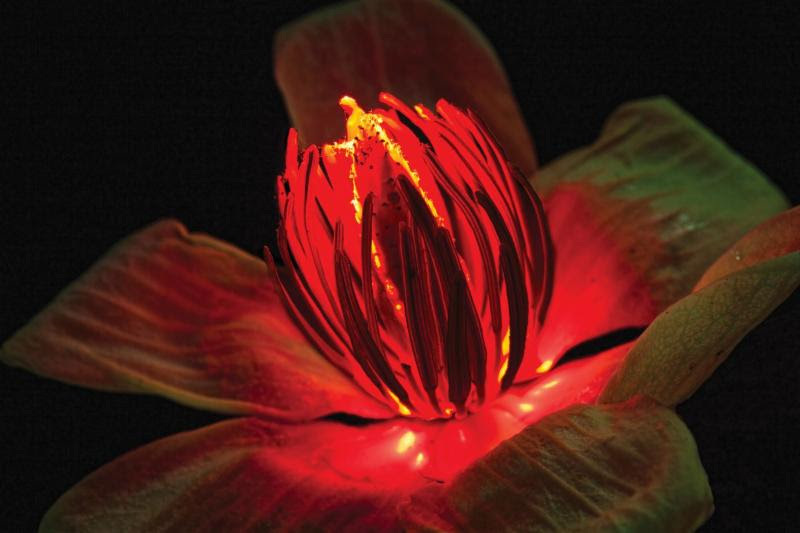 Through innovative use of different types of light directed from different directions, his flowers appear to glow from within. Opened on May 19. Bids due on June 12. Please register by visiting teatown.eventbrite.com or by calling (914) 762-2912, ext.110. Advanced registration is required for all programs. $7 per person or free for members, unless otherwise noted. Join Conservation Café—a consortium of seven Westchester County-based partners—for a discussion on pesticides. Learn about the current status of pesticide use regionally and statewide, the impact of pesticides, and community-based efforts to reduce the use of pesticides. For adults. Taking place at Pace University, Kessel Student Center, Gottesman Room. Teatown’s new Hilltop Trail climbs the highest point at Teatown for a great view of the Hudson Highlands. 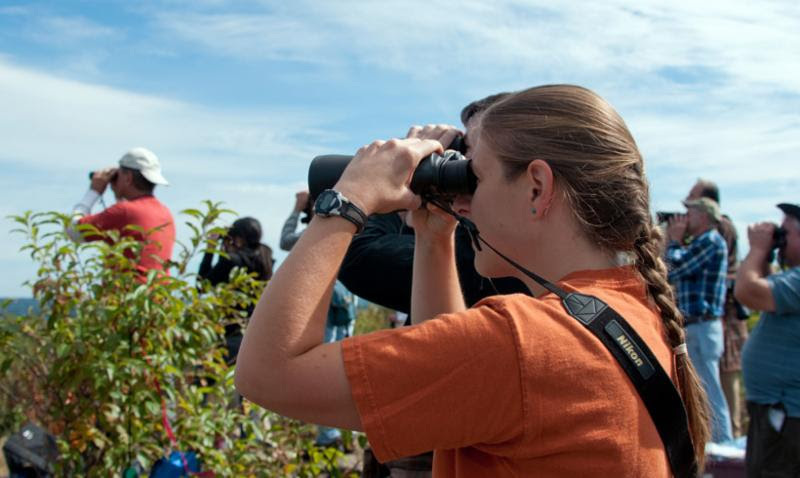 We’ll be on the lookout for hawks, and warblers, snakes and butterflies. For everyone. Flowers are pollination stations! Just how does pollen get to where it has to go? 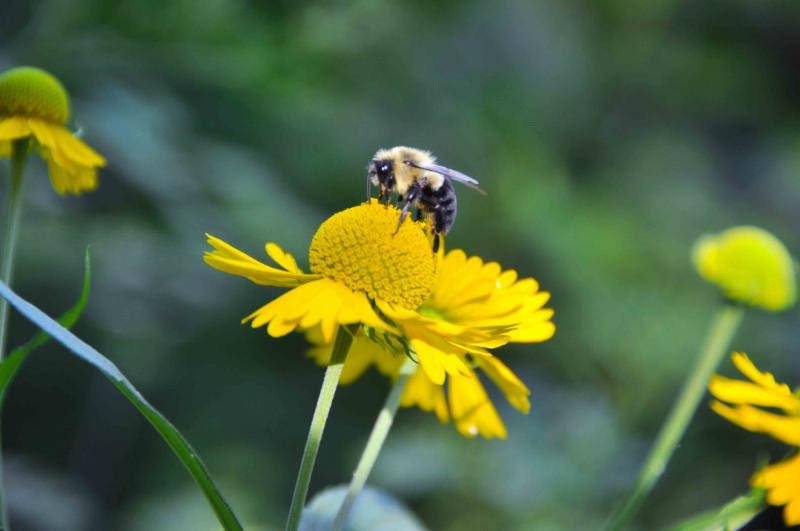 What role do animals play in pollination? By dissecting a flower we’ll see what the buzz is about, and learn why protecting our native pollinators is vital. For families. Fahnestock’s higher elevation and forested paths offer many opportunities to spot a variety of warblers, vireos, hawks and other birds. For Adults. Meet at the Pelton Pond Parking area on Rte. 301. 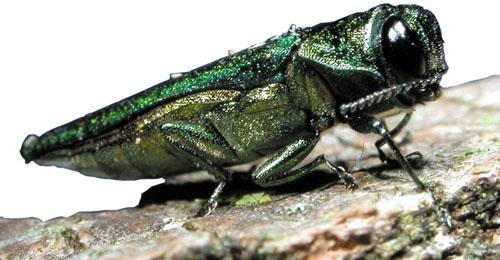 Learn how to identify new forest pests invading our region, long-term mitigation and management strategies for Hemlock Woolly Adelgid or Emerald Ash Borer (EAB), and how to become involved in efforts to monitor pests, block pathways of introduction or locate EAB-resistant ash. For adults. Unless otherwise noted, all programs meet in the Nature Center. Some programs fill up, so please register early. This entry was posted in blog, Chappaqua and tagged Chappaqua Homes for Sale, Chappaqua Luxury Real Estate, Chappaqua NY Homes on June 4, 2017 by Robert Paul. Single-family housing starts dipped to a seasonally adjusted annual rate of 828,000 in November, according to new residential construction data released by the Commerce Department Friday morning. This month’s result marks a -4.1% decrease from October’s downwardly revised rate of 869,000 and represents a 5.3% gain compared to November 2015, when the estimate was 786,000. Total housing permits, the leading indicator for future starts, fell -4.7% in November, primarily due to a big dip in the multifamily sector, especially permits for 5-unit or more structures, which fell -15.8% month-over-month. Single-family permits rose 0.5%, indicating that next month’s report could be mediocre. Permits issued for 1-unit structures increased 7.0% in the Midwest, and 2.7% in the West, while the Northeast and South experienced single-digit losses month-over-month. Total privately-owned housing completions increased 15.4% in November to a seasonally adjusted annual rate of 1,216,000. 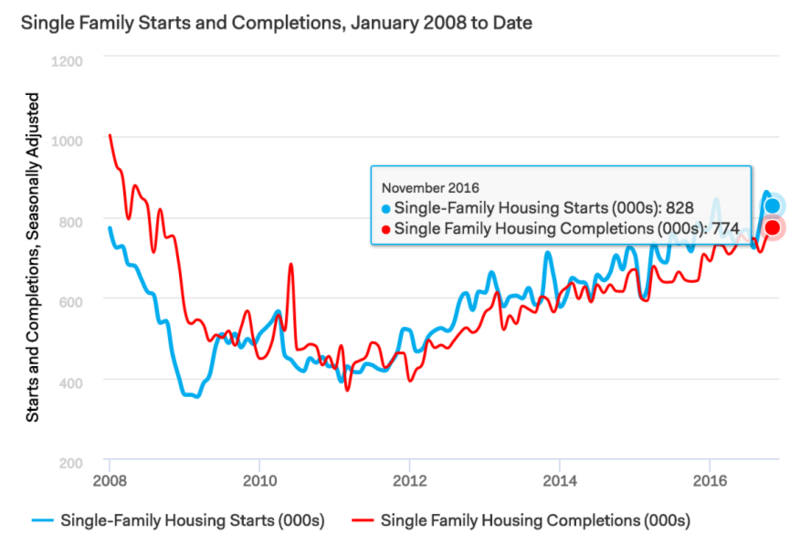 Completions of both single-family and multi-family housing increased in November following October’s strong report, by 3.3% and 44.5%, respectively. This entry was posted in Chappaqua and tagged Chappaqua Homes for Sale, Chappaqua Real Estate, Chappaqua Real Estate for Sale on December 16, 2016 by Robert Paul. Last June, Dana Rice, a real estate agent and house flipper, was deep in the throes of a massive remodeling project. She had bought a 1938 home in an upscale neighborhood of Bethesda, Maryland, for $600,000 and intended to flip it for a hefty profit. Four months and $400,000 in construction costs later, Rice put the home on the market last weekend for $1,469,000. A million dollars of her money is at stake. “Getting into the project is a risk because of the amount of money that you’re putting in, but overall at the end of the day, the ratio is the same,” Rice said as she put out candles and fliers for the first open house. Rice added significant square footage, along with high-end finishes throughout. The so-called industrial cottage-style home is now 2,650 square feet with five bedrooms and three bathrooms. There is a small back patio, but the yard was sacrificed to make the home larger. Rice says it is the opposite of the McMansion trend — not a tiny home for sure, but a ‘not-so-big’ home with top-of-the-line appliances, lighting, flooring, fixtures and systems. 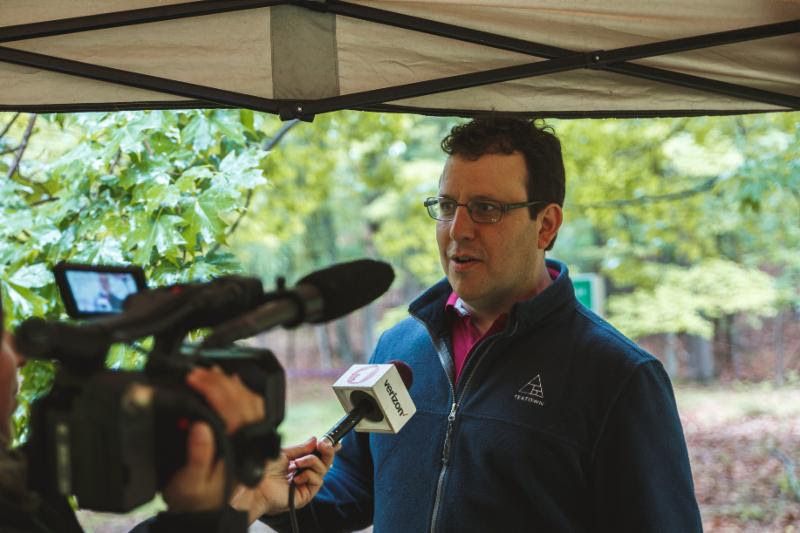 Not only is house flipping on the rise in today’s increasingly competitive market, but average gross profits are now the highest since 2000, or since ATTOM Data Solutions, a real estate sales and analytics firm, began tracking flips. House flippers in the second quarter of this year saw an average gross profit of $62,000, up from $57,900 in the second quarter of 2015. 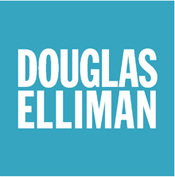 That gross profit represented an average 48.8 percent return on the original purchase price, up from a 47.5 percent a year ago. “It’s so fast and it’s so hot, you really have to be careful about who’s doing the work, because you’re going to pay that premium just to get that flip, but you need to look behind the curtain to see how they did it,” Rice cautioned. Close to 40,000 investors, both individuals and institutions, completed at least one home flip in the second quarter of this year, the highest number in nine years. Home flipping peaked about 10 years ago, during the height of the housing boom, when mortgages were easier to pick up than a quart of milk. That is not the case today. “While an increasing number of flippers are financing their purchases, more than two-thirds are still using cash to purchase compared to about one-third using cash to purchase back in 2006,” said Blomquist. With so many new flippers in the market, the concern is in the craft. Rice actually spent more than a year remodeling her house, her fourth flip. That is longer than usual, but at her price, the house had to match the high-end market. “The market is pretty strong for fixtures, finishes — everybody watches the TV shows. 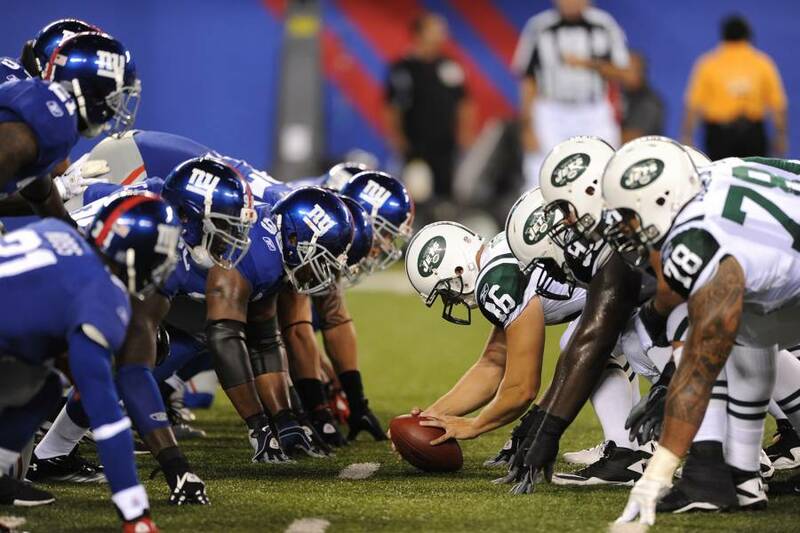 They have an expectation, and we want to meet it,” said Rice. There were also a few bumps along the way. This entry was posted in Chappaqua and tagged Chappaqua Homes for Sale, Chappaqua Luxury Real Estate, Chappaqua Real Estate for Sale on December 11, 2016 by Robert Paul. With rents rising in cities and states across the US, many renters struggle with affordability. In Miami, Los Angeles, and Orlando, for example, more than 55% of renters were cost-burdened in 2014, spending more than 30% of their income on rent. Rents have moderated recently in expensive metros like San Francisco and New York, but continue to climb rapidly in Dallas, Seattle, and Denver. To better understand how rents and affordability have changed over time, Apartment List analyzed Census data from 1960 – 2014. We find that inflation-adjusted rents have risen by 64%, but real household incomes only increased by 18%. The situation was particularly challenging from 2000 – 2010: household incomes actually fell by 9%, while rents rose by 18%. As a result, the share of cost-burdened renters nationwide more than doubled, from 24% in 1960 to 49% in 2014. 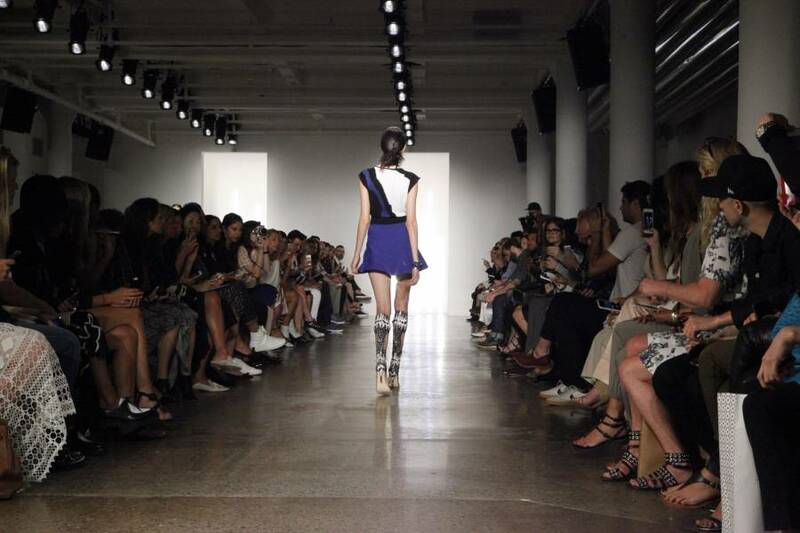 These trends are repeated in cities and states across the country. Since 1980, incomes in expensive areas like DC, Boston, and SF have risen rapidly, but rents have increased roughly twice as fast. In Houston, Detroit, and Indianapolis, incomes have actually fallen in real terms, while rents have risen by ~15-25%. The only urban areas where incomes kept pace with rising rents were Austin, Las Vegas, and Phoenix. 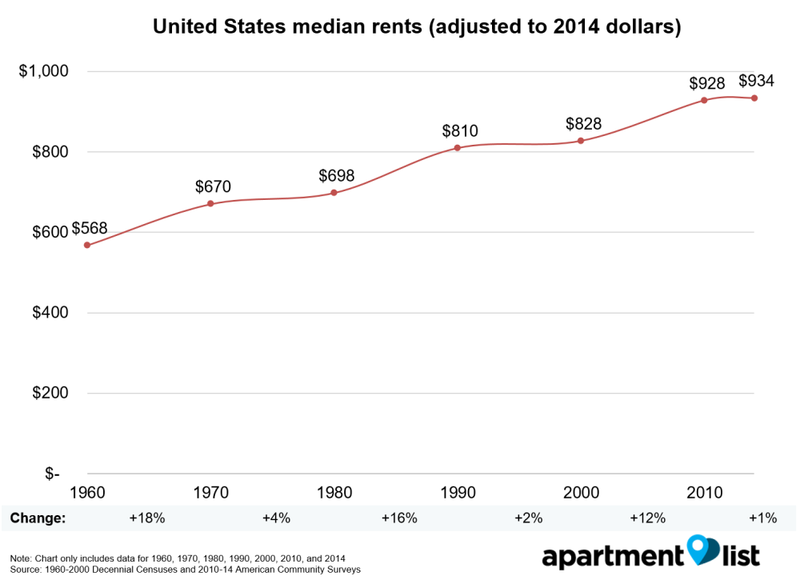 First, we took a look at median rents in the United States, from 1960 to 2014. 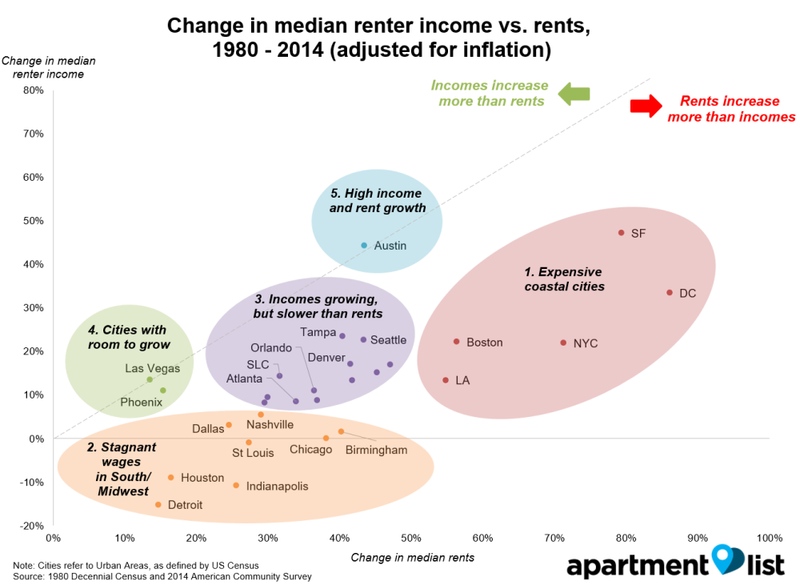 All data was adjusted for inflation, allowing us to compare rents across decades. Median rents have increased steadily during that time period, from $568 in 1960 to $934 in 2014 – an increase of 63%. Rents rose the fastest during the 1960s (18% increase), followed by the 1980s (16%). In contrast, the 1970s and 1990s saw relatively small rent increases, at 4% and 2% respectively. Next, we compared the change in rents with household income, over the same period. Both sets of data were adjusted to 2014 dollars, and indexed to 1960. Looking at the results, the 1990s were the best decade for renters, as rents barely budged (+2% over the course of the decade), whereas incomes increased by nearly 10% – a 7% difference overall, and the only decade in which rents increased less than incomes. Renters did relatively well in the 1970s as well, with both rents and incomes showing small increases. The decade from 2000-2010, however, was the worst for renters. They were hit by rising rents (+12%) and declining incomes (-7%), making them significantly worse off overall. That decade was also the only decade in which real household incomes fell. Things have improved a bit since, as rents and incomes flattened from 2010-2014, but it’s not surprising that many Americans say that they are worse off now than eight years ago. What has the combination of rising rents and stagnant incomes done to renters? To answer the question, we used JCHS tabulations of cost-burden rates (the share of renters spending more than 30% of income on rent). 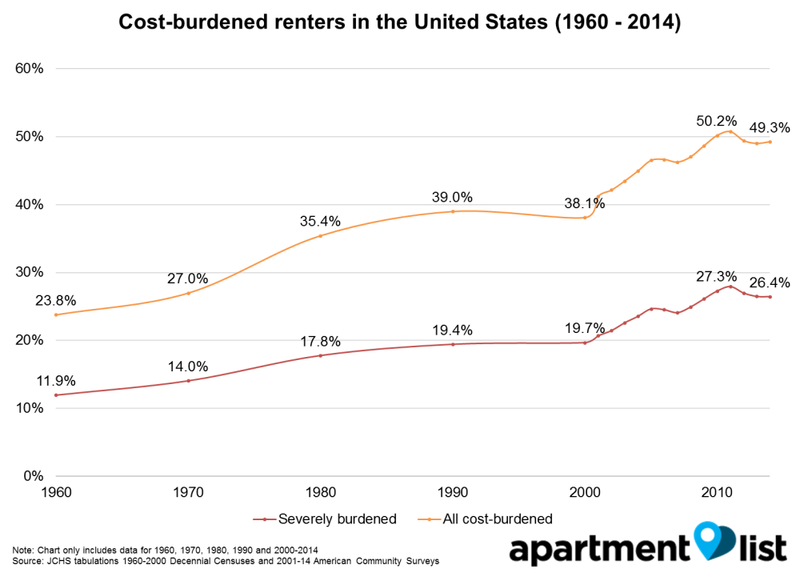 Unsurprisingly, the share of cost-burdened renters increased from 1960 – 2014, but the magnitude of the increase is dramatic. 24% of renters were cost-burdened in 1960, but that number jumped to more than 50% in 2010, before declining slightly in the years following. Mirroring the data on rents and income, the share of cost-burdened renters actually declined slightly in the 1990s, but spiked from 2001-2005, and again from 2007-2011. The US renter population is larger than it has ever been (43 million households, or 37% of the total population), and nearly half of them are struggling to pay rent. Next, we looked at cost-burden rates by household income quintile. 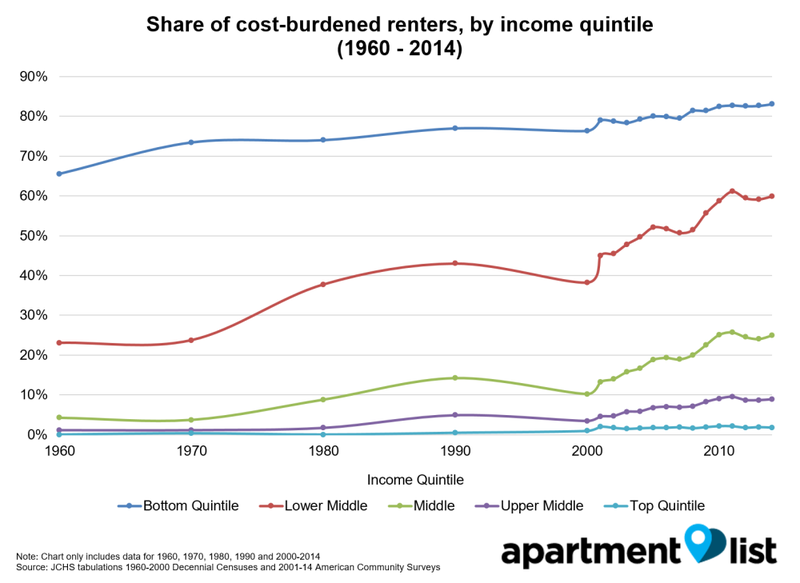 Renters with incomes in the lowest 20% have had cost-burden rates greater than 70% since the 1970s, and affordability has continued to decline in recent years. Among renters in the lower middle bracket (making up to $41,186 a year), however, the increase in cost-burden rates has been significant, with an increase of 22% since the year 2000. Renters in other income brackets have fared better, but cost-burden rates have risen across the board. Expensive coastal cities saw significant increases in incomes, but not enough to keep pace with rising rents. Washington, DC, for example, had a 33% increase in real incomes, but rents rose by 86%. Similar results were seen in San Francisco, New York City, and Boston. Renters in Los Angeles struggled the most, as rents jumped 55%, even as incomes only increased 13%. Renters in the Midwest and South had stagnant or declining incomes, even as rents increased. Incomes in Dallas, Nashville, and Chicago barely budged, even as rents rose by 25% or more. In Houston, Detroit, and Indianapolis, incomes actually fell by ~10-15%, even as housing costs continued to climb. Other cities saw incomes increase, but not fast enough to keep up with rents. 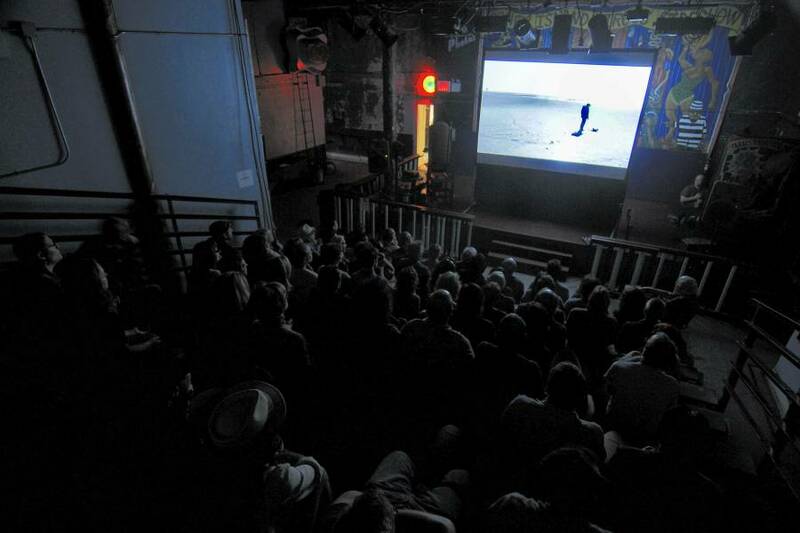 This was the biggest group, comprising a varied list of cities, from Seattle and Portland on the West Coast; to Orlando, Atlanta, and Miami on the Southeast; and Denver and Salt Lake City on the interior. 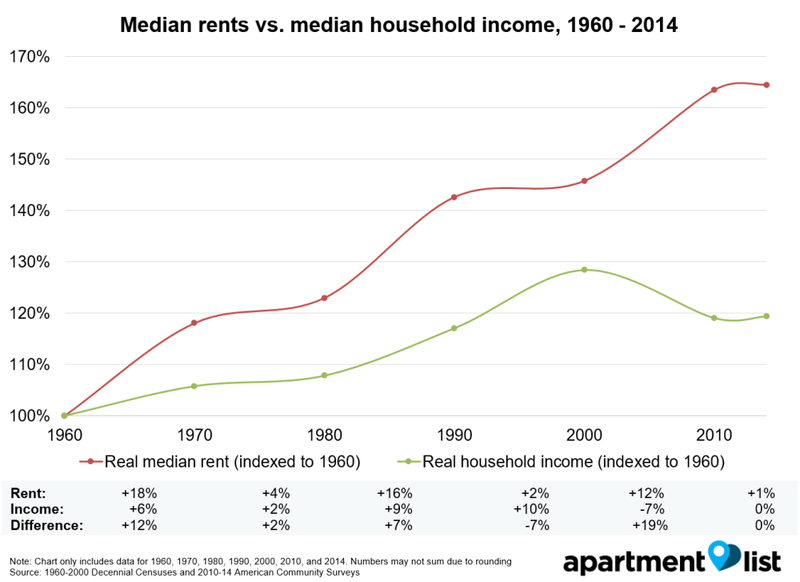 In some ways, this group mirrors what has happened in the US as a whole: incomes have increased by 15-25% since 1980, but rents have grown twice as fast. Cities with room to grow – Las Vegas and Phoenix – had relatively small rent increases, allowing incomes to keep up. Both cities added large amounts of housing inventory in the 1990s and 2000s, which helped keep a lid on rents. Incomes in these urban areas did not increase any faster than most other cities, but small rent increases mean that renters are not much worse off than before. Only one city had high income growth that matched rent increases – Austin, TX. Rents in Austin rose rapidly from 1980 – 2014, but incomes grew even faster. Austin’s population has more than doubled since 1980, causing rents to increase by more than 40%, but real incomes increased even faster. 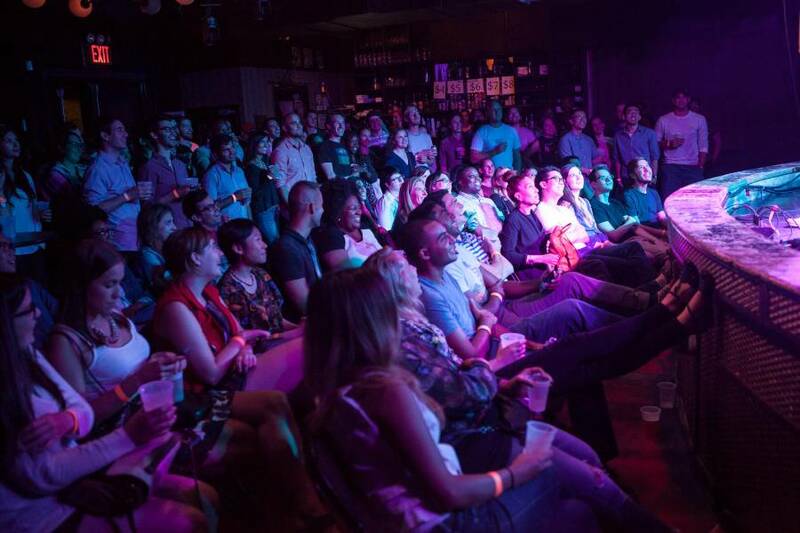 Strong employment growth in Austin has attracted many millennials, but wage growth means that Austin is the only urban area where incomes have risen more than rents. Rents have risen rapidly in many cities across the US, but looking at things over more than fifty years helps us understand the impact of these trends. If rents had only risen at the rate of inflation, the average renter would be paying $366 less in rent each month, which would allow many to more than double their down payment savings.When coupled with stagnant incomes and soaring student debt, it is no wonder that renters across the country are struggling with affordability. 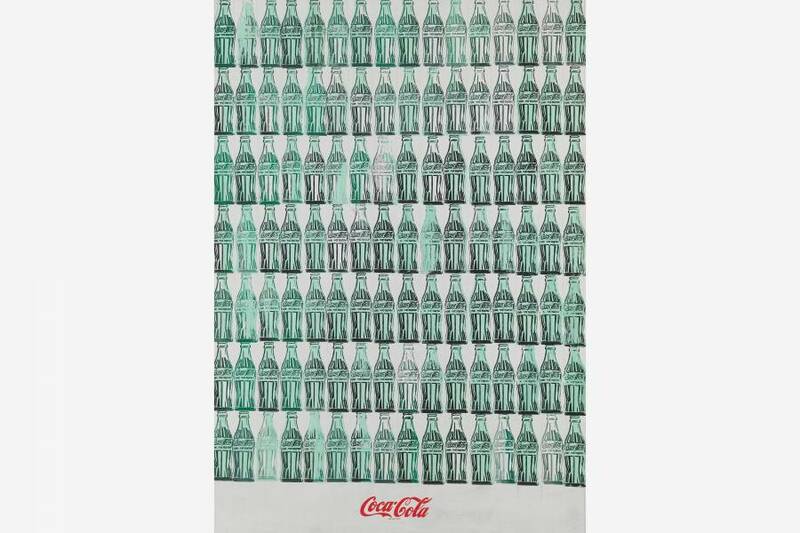 Nearly half of them are cost-burdened, compared with less than a quarter in 1960. This entry was posted in Chappaqua, Westchester NY and tagged Chappaqua Homes for Sale, Chappaqua Real Estate, Chappaqua Real Estate for Sale on July 4, 2016 by Robert Paul. U.S. home builders remain optimistic that the housing market will improve, but their expectations for sales over the next six months have dimmed just as the spring home-selling season gets under way. Though new homes represent only a fraction of the housing market, they have an out sized impact on the economy. Each home built creates an average of three jobs for a year and generates about $90,000 in tax revenue, according to NAHB data. This entry was posted in Chappaqua and tagged Chappaqua Homes for Sale, Chappaqua NY Real Estate, Chappaqua Real Estate for Sale on March 19, 2016 by Robert Paul. A new survey from Bank rate found that primary reason 29 percent of renters can’t buy a home is they can’t afford a down payment. However, at least one out of five of them are overestimating how much they think they will have to raise for a down payment. The more than 3250 non-homeowners participating in the survey expect that they would have to put down 24 percent of the purchase price. Some 21 percent of those non-owners, or one in every five of those who think they can’t afford a down payment, believe they would have to put down more than 20 percent of a home’s price. In fact, the average down payment last year was nearly ten points lower, about 14.8 percent of the purchase price, according to RealtyTrac. Millennials, many of whom use FHA financing or the new low down payment programs from Fannie Mae and Freddie Mac, put only about 7 percent down, according to an NAR report on Millennials. NAR’s 2015 Profile of Home Buyers and Sellers reported virtually the same down payment levels. First-time buyers financed 94 percent of their homes and put down 6 percent; repeat buyers financed 86 percent and paid the remaining 14 percent in cash. Even the average down payment for just conventional loans was lower than the 24 percent average of renters in the Bankrate survey– 17.36%, according to a Lending Tree. The Bankrate study raised eyebrows when it reported that the survey found that 35 percent of non-homeowners “just don’t want to own a home yet”. However, the real news may be the rampant and harmful misinformation about down payments that it has surfaced. This entry was posted in Chappaqua, Westchester NY and tagged Chappaqua Homes for Sale, Chappaqua Luxury Real Estate, Chappaqua Real Estate for Sale on March 7, 2016 by Robert Paul. When it comes to hydrangeas, I’m certifiably loony. Or, at least, I used to be. The source of my obsession was a variegated hydrangea. I bought it in full flower, and the azure, lacecap blooms were simply stunning against the backdrop of broad, spade-shaped leaves edged with creamy white. Then winter hit and it died to the ground. New shoots burst forth in spring, adorned with luscious foliage, but no blooms appeared. Ditto the next spring. And the next. Apparently the plant was root-hardy here, but its stems and flower buds—which form on year-old growth—were not. In my USDA Hardiness Zone 6 Connecticut garden, Old Man Winter prevailed. But it got me thinking that if I kept my variegated hydrangea (Hydrangea macrophylla‘Tricolor’) warmer, its stems and buds might survive. So I decided to cover the plant in winter. I bought one of those homely-looking Styrofoam cones sold to protect tea roses in winter, capped the hydrangea, and covered that with a layer of shredded leaf mulch and pine boughs. Then I waited until the next summer when—lo and behold—the hydrangea flowered. Emboldened by success, I started experimenting with other marginally hardy plants, using everything from small glass domes to homemade, doghouse-sized plastic greenhouses. I soon realized winter cover-ups could provide an extra zone or more of warmth. I’ve used these devices to help late-season transplants get established, protect recently transplanted evergreens, and coddle a few choice perennials that would otherwise never survive winters in my garden. There’s nothing complicated about it. I rarely spend more than 15 minutes prepping a plant for winter, and unveiling it for spring takes even less time. My methods aren’t foolproof. There’s still a casualty or two every season. But even with occasional losses, my efforts are repaid several times over each year. Everyone knows that plants die if winter temperatures are too frigid for them to endure. But severe weather can pose a threat even to hardy plants. An early-season burst of bitter cold can shatter the cells of woody plants that haven’t yet hardened off. Later in the season, those same plants could march through a similar cold snap in stride. Deeper into winter, cold, dry winds can draw the life from conifers or broad-leaved evergreens. Even warm spells can be perilous. High temperatures can evaporate the last reserves of moisture from the transpiring leaves of evergreens whose roots, locked in frozen ground, are unable to draw replenishing moisture from the soil. Most hardy perennials could sleep through winter peacefully if tucked under a thick blanket of snow. But where snowfall is iffy, exposure to Jack Frost’s full force may kill marginally hardy plants. 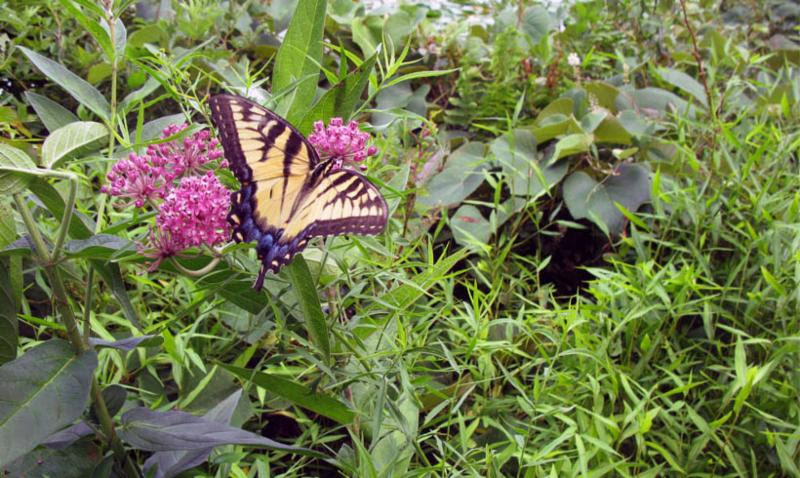 In poorly draining soils, winter wet can rot the crown of hardy perennials. And the churning freeze-thaw cycles of early spring can easily heave plants—roots and all—from the ground. To complicate matters further, the tissues of some plants, particularly trees and shrubs, are more susceptible to cold temperatures in their youth or their first year or two after transplanting. Only when they’ve reached a certain level of maturity are they fully hardy. My garden is subject to just about every one of those threats. So, to prepare marginally hardy or recently planted perennials, trees, and shrubs for winter, I make sure at-risk plants are deeply watered before the ground freezes. In addition, any recently transplanted or marginally hardy evergreens get a spray of an anti-transpirant, like Wilt-Pruf, to seal the microscopic openings in their leaves. When the ground has frozen, I give new plants—even those rated bone-hardy for my garden—a 2- to 4-inch blanket of mulch, either ground bark or, preferably, shredded leaves. I also use pine boughs or branches cut from the Christmas tree. These make an excellent, airy mulch for young hellebores or any fledgling evergreen perennial because they help moderate temperature changes and offer protection from the winter wind and sun. Plants in need of special coddling—anything unlikely to survive winter’s cold and wet—should be tucked into a custom, seasonal shelter before cold weather settles in, usually about late November in my garden. It doesn’t have to be elaborate. I’ve used overturned plastic pots, lengths of burlap, shredded leaves, even a heavy-duty paper bag. Unless you make the effort to build an artistic shelter, chances are that an array of protected plants is going to look like a hastily abandoned campground. But I can live with the less-than-good looks for a year or two until a newly planted tree or shrub is well-established. Even so, any plantings that will need long-term coddling shouldn’t be positioned prominently in the stark winter landscape. To avoid aesthetic crises, I tuck my tender treasures at the bottom of a gentle slope in the backyard, where they can’t be seen from the house. 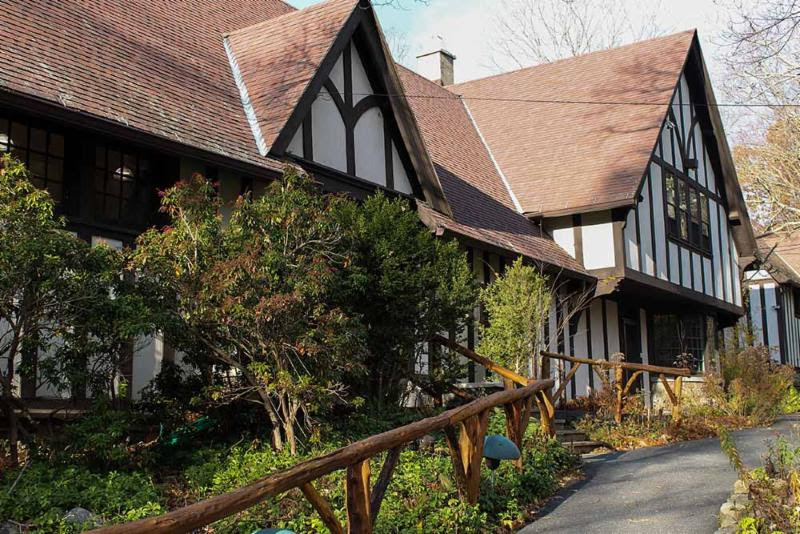 This entry was posted in Chappaqua, Westchester NY and tagged Chappaqua Homes for Sale, Chappaqua NY Real Estate, Chappaqua Real Estate for Sale on November 13, 2015 by Robert Paul. With 78 million baby boomers entering or on the verge of retirement, a concerted national effort is required to adapt homes and communities for the 73 percent of seniors who prefer to age in place, according to a new report released yesterday by the Bipartisan Policy Center (BPC). That’s bad news for the nation’s real estate and housing finance industries, who have been anticipating a flood of transactions from Boomers selling their long-time residences. But its good news for remodelers eager to retrofit family homes to make them senior-safe. Many homes and communities are ill-equipped to accommodate this desire. Many of today’s homes were designed at an earlier time, before the demographic changes now transforming the country were even recognized. Most lack the necessary structural features that can make independent living into old age a viable, and communities so they are “senior friendly”. the BPC said. This entry was posted in Chappaqua, Westchester NY and tagged Chappaqua Homes for Sale, Chappaqua Real Estate, Chappaqua Real Estate for Sale on October 2, 2015 by Robert Paul.